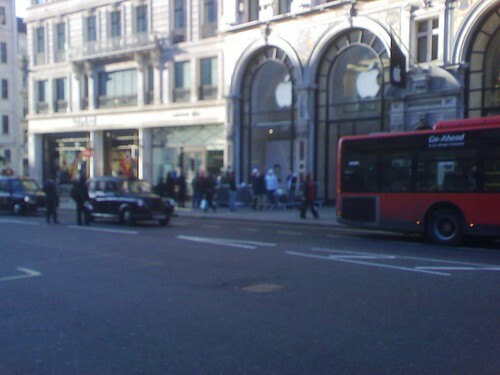 iPhone arrives in the UK today and the question is what happened to the mass hysteria? I took the attached grainy photo (on my useless SonyEricsson P990i) as I walked past. Given the coverage of the original launch in the US and the Apple PR machine getting a head start, I expected a little bit more interest that this. It’s left me thinking that Apple got it a little wrong with the marketing of this baby. Where was the crowd!!! I’m really busy today with some urgent work but look out for my post on what Apple could learn from Nintendo about launching better products into the tech market. Yeah. Apple sure needs to learn about marketing. Are you serious? Are you even a marketing guy, or are you just being thick on purpose? I think most of the people in the UK understand that there are plenty of iPhooones to go around and they hardly need to queue up in the rain for one. Anonymous, - you may wish to wait until I write the article before telling me what an idiot i am. I love Apple products but I don't think they're perfect!